So this is a recipe for all of my mommy readers, as well as my mac and cheese loving readers, mommies (and daddies) or not. I posted a lot of Melissa Clark recipes last winter before I realized I needed to start expanding my cookbook horizons, but I think it’s been long enough that I can start (over) posting again. 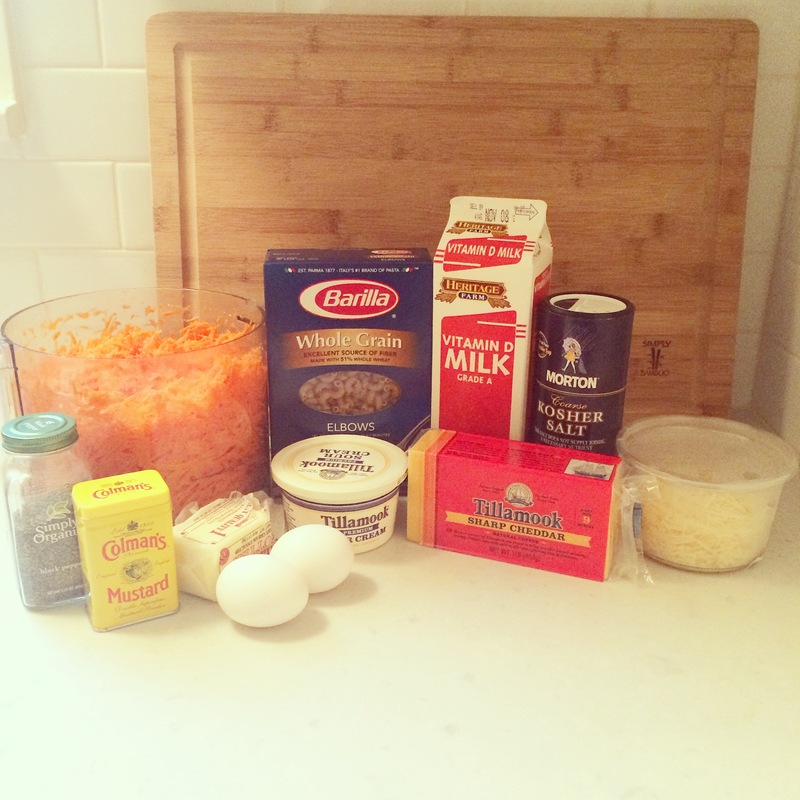 While this mac and cheese might not be anything that exciting, but for the carrots, it’s a good basic recipe – it’s not overly un-healthy (as macaroni and cheese recipes go), you can throw it together pretty quickly, and you likely have most or even all of the ingredients in your fridge/pantry already. And the carrots make it fun because you can trick your picky eaters (or at least attempt to trick your picky eaters) into thinking the orange shreds are cheese. I took care of my cousin’s kids for a couple days last month while she and her husband were out of town, and after an afternoon of school pickups and after school activities, we arrived home at five and I had this on the table – with roasted veggies on the side, no less – by six. Which apparently is still really late for dinner for children, but hey, isn’t that what goldfish crackers are for? The four year old gobbled it up, carrots and all; the eight year old was a little more discriminating, but although there was a pile of grated carrots on his plate once the mac and cheese was otherwise gone, he still asked to take the leftovers in his lunch the next day, so I consider it a success. 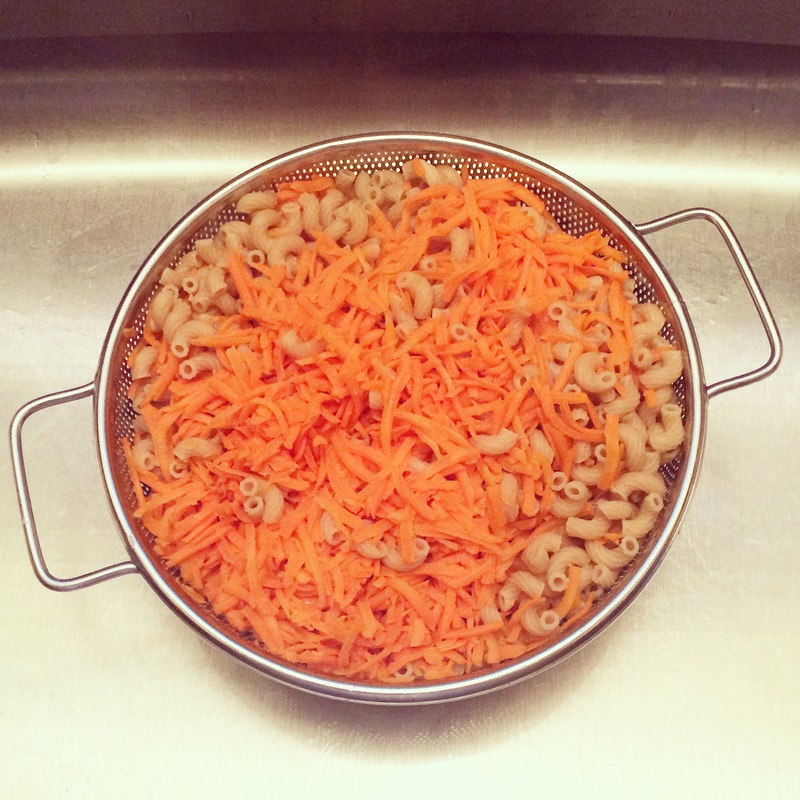 Just grate your carrots and throw them into your pasta three minutes before it’s finished cooking. 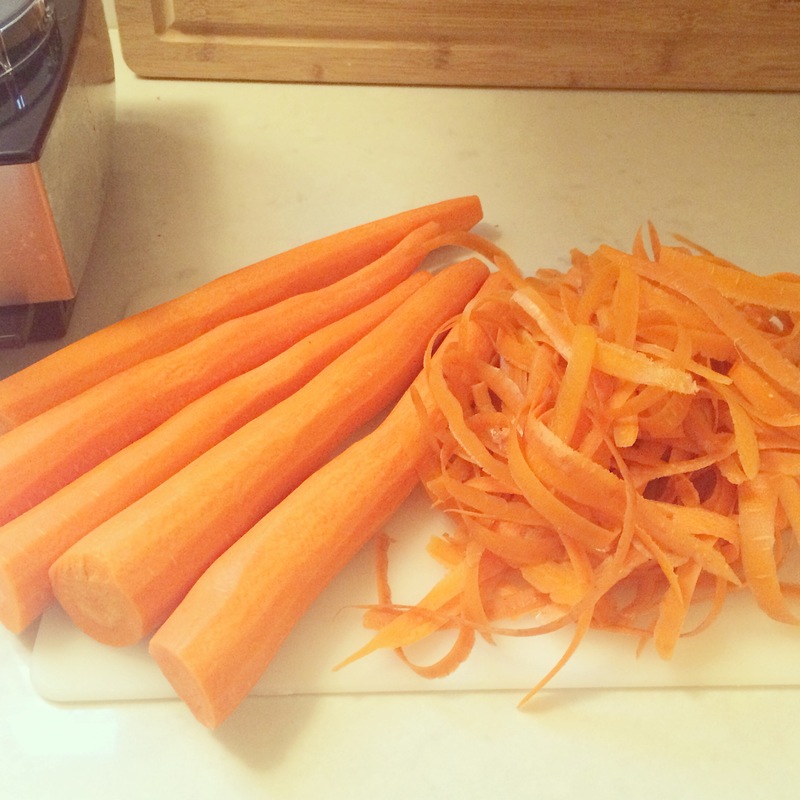 You can buy pre-grated carrots, but it takes two minutes to grate them yourself (food processor or even on a box grater) and I feel like it really makes a difference. Just whisk together the milk, eggs, sour cream, salt, pepper, and mustard powder, and toss it with the pasta, cheese, carrots, and butter. Top with cheddar and parmesan and stick it in the oven for half an hour. Dinner for two hungry kiddos in under an hour, auntie win! 1. Preheat the oven to 400 degrees F and grease an 8-inch-square baking pan. Arrange a rack in the top third of the oven. 2. 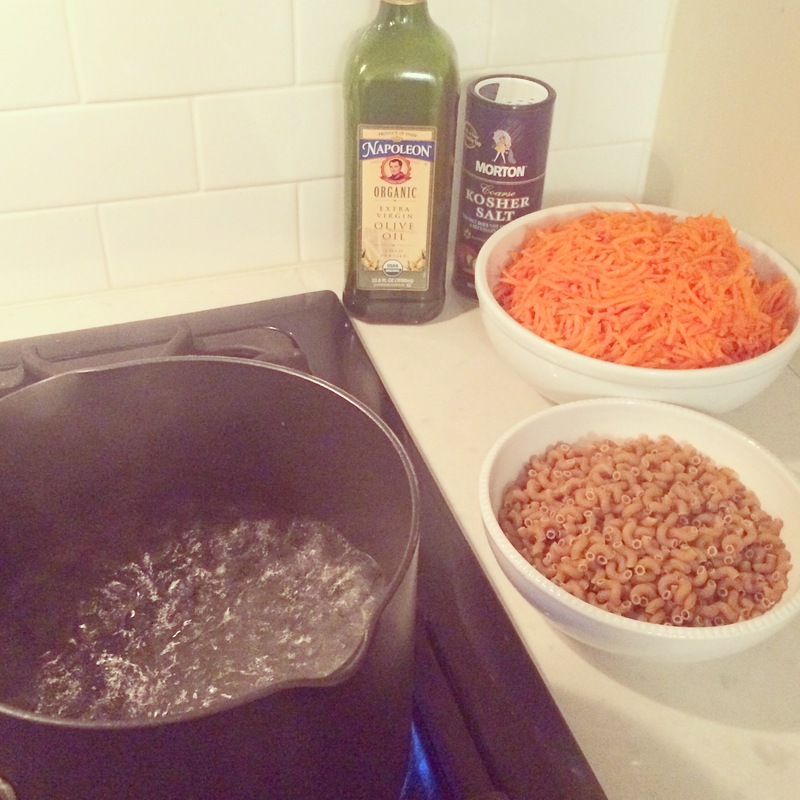 Cook the macaroni according to the package instructions in a large pot of boiling salted water. 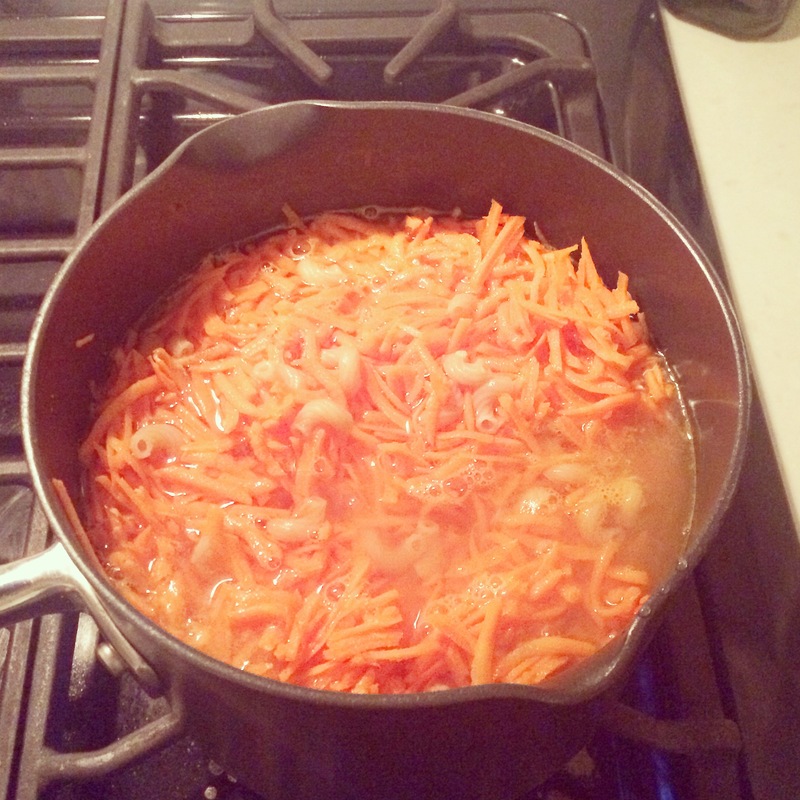 Add the carrots three minutes before the pasta is finished cooking; drain well. 3. 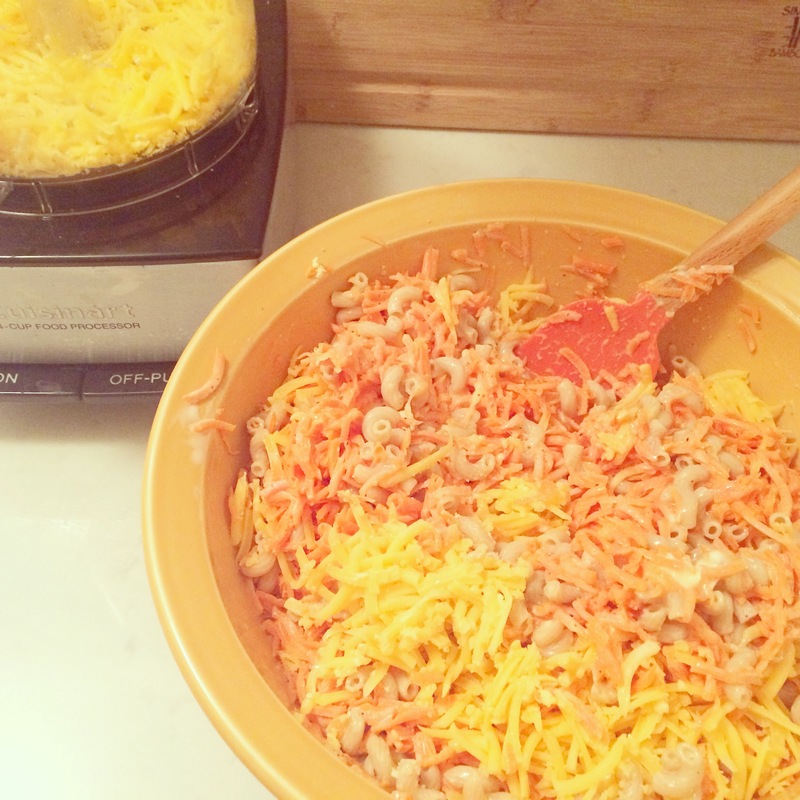 While the pasta is hot, stir in the butter and all but 1/2 cup of the cheddar. In a bowl, whisk together the sour cream, milk, eggs, salt, mustard powder, and pepper. Fold the mixture into the pasta. 4. Scrape the mixture into the prepared pan. Sprinkle the remaining cheddar and the parmesan over the top. Bake until the casserole is firm to the touch and golden brown, about 30 minutes. 1. Feed this dish to kids as is; grown-ups should indulge with a squirt of fiery Sriracha or other hot sauce all over the top. 2. 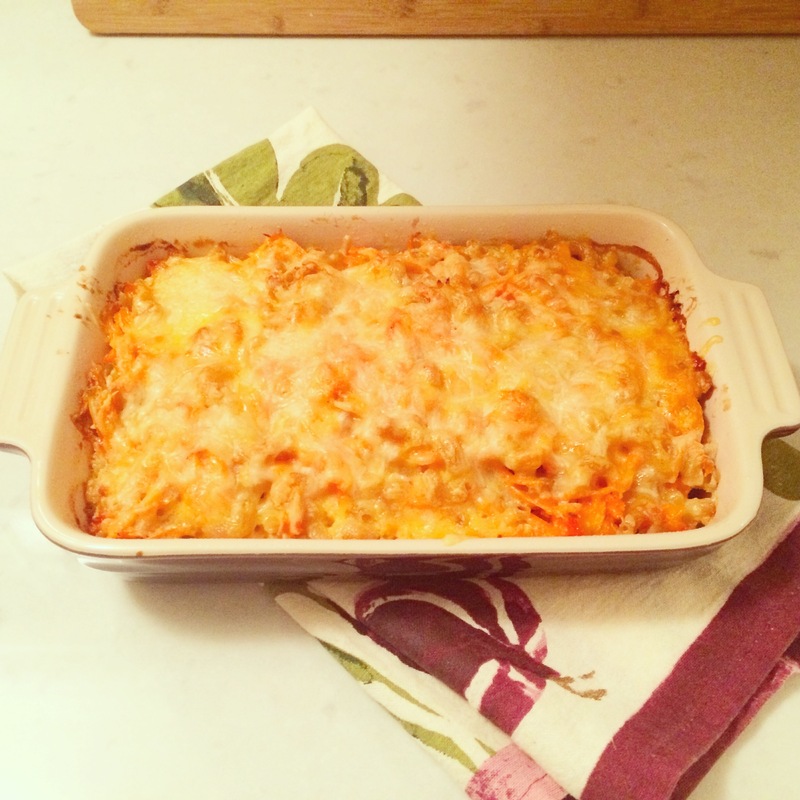 You can vary the cheese to give this rather plain (if tasty) dish more personality. Gruyère, aged cheddar, pecorino, and aged Gouda will all add a sophisticated allure that will raise it above mere kids’ food. 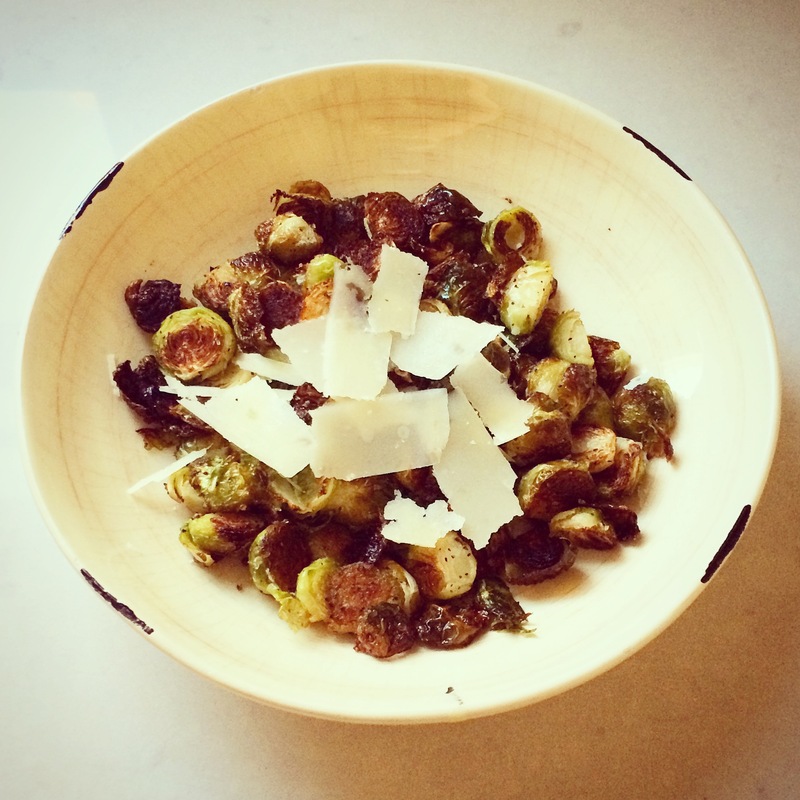 In an effort to make the meal a little more well-rounded, I made brussels sprouts for the kiddos too – and they ate them, that’s how good these are! Most of you don’t need me to tell you how to roast vegetables, but just in case you’re someone who likes instructions: I usually roast mine at 400 for 20-30 minutes, just tossed lightly with olive oil, salt, and pepper. Top with a little grated or shaved parmesan, optional. 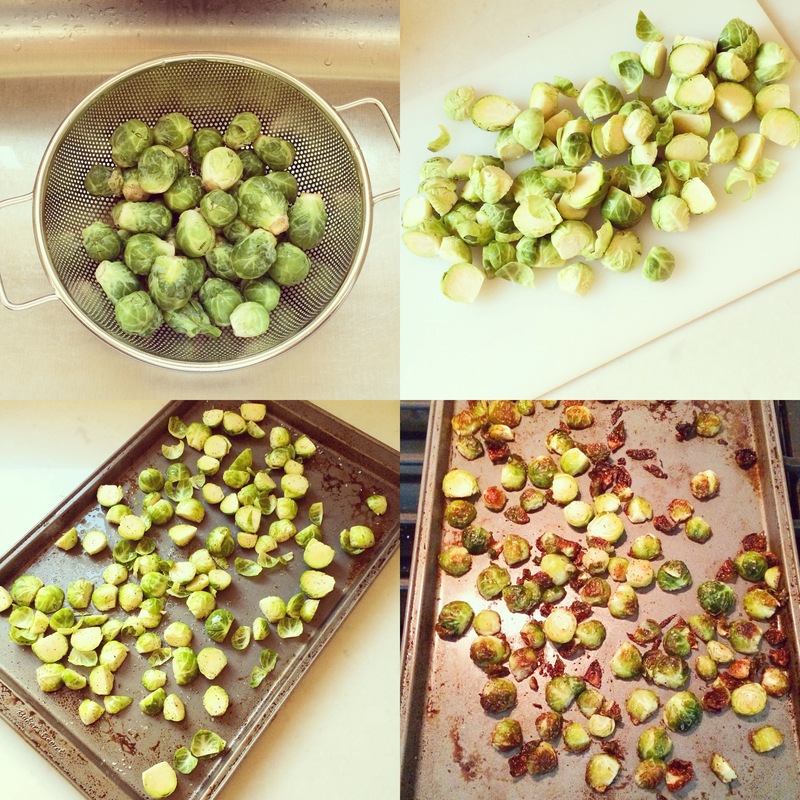 I’ve been doing a lot of Brussels sprouts, broccoli/broccolini, and squash lately – if anyone has any other go-to fall veggies they love to roast, I would love to hear them in the comments!